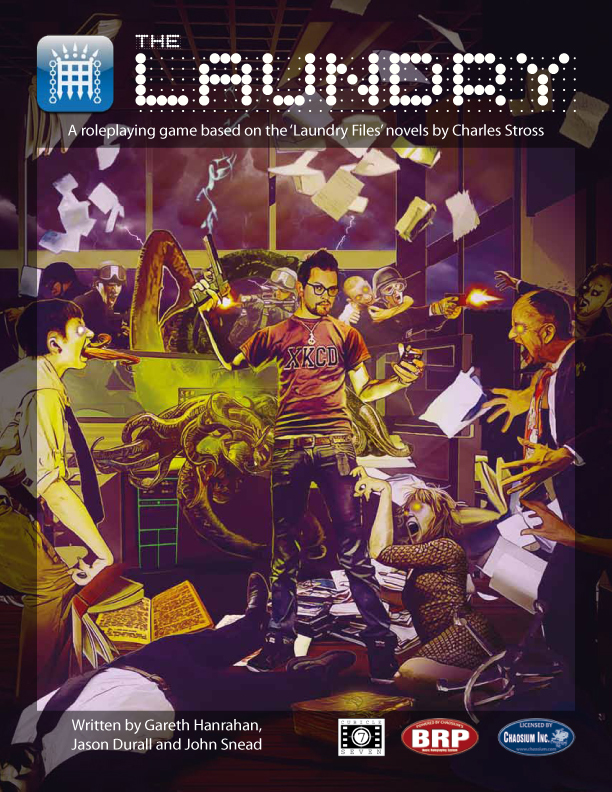 Cubicle 7 Entertainment is producing a roleplaying game based on the award-winning Laundry series (The Atrocity Archives, The Jennifer Morgue , and the forthcoming The Fuller Memorandum) by the even-more-award-winning Charles Stross, and uses the also-award-winning Basic Roleplaying System  by Chaosium Inc.
“The books are Lovecraftian spy thrillers. The best elements from both genres are thrown together with a sprinkling of long lost Nazis, terrorist cultists, other foreign governments wanting a piece of the action, as well as Her Majesty’s Civil Service.” added Cubicle 7’s Angus Abranson. The Laundry is a branch of the British secret service, tasked to prevent hideous alien gods from wiping out all life on Earth. Players take the part of Laundry agents, cleaning up the mess after things go wrong or, sometimes, even managing to prevent the manifestation of ultimate evil. Agents have access to the best equipment they can get their superiors to approve, from Basilisk Guns to portable containment grids to a PDA loaded up with Category A countermeasure invocations. The game has been designed and written by industry veterans Gareth Hanrahan, Jason Durall and John Snead. “I’m really excited to be working with Cubicle 7 to bring the sinister world of the Laundry to a wider audience,” says Charles Stross, Hugo award-winning author of “The Atrocity Archives” and “The Jennifer Morgue”. The Laundry RPG is a self-contained rulebook and will be supported by a number of sourcebooks and adventure campaigns. The game is due to be released in July 2010.